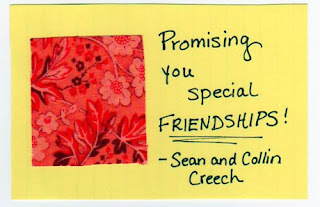 So the "Poppy project" that I mentioned last week is going to be her 100 Good Wishes Quilt! And we already received 2 quilt squares! 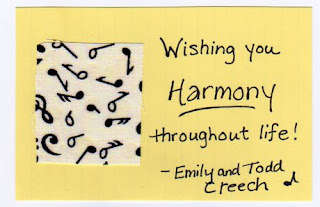 These are from the music teacher that I work with, Emily, and her family. This is going to be so much fun to see what everyone turns in! And my goal is to scan each "wish and fabric scrap" so that everyone can see the progress, but we'll see how that goes. I've been sending the letters out over the past week or so, but if you would like to participate in Poppy's quilt, leave me your email address and I'll be happy to send you the info.